I have to share the original moment I lived while reading this book. I was on the bus, riding home from our field trip to a science museum in North Carolina, sharing a seat with a 6th grade girl who used JUSTIN BIEBER twice as her word in our morning games of Hangman. I was a bawling mess over the book, so these sweeties were trying to comfort me, while also asking me to try on the mustache-shaped mood ring they bought at the gift shop so they could see what color "sad" is. I love being a teacher. Anyway, back to John Green's masterpiece. If you read young adult literature, you've probably already heard tons about this novel about two star-crossed teenagers who have cancer. I really don't want to give any of the plot away, so I will share how much I loved the main characters, Hazel and Augustus. Hazel is the type of sixteen year old we all wish we were (without the cancer, obviously). She is wise and funny, beautiful and confident, plus she gets along well with her parents. 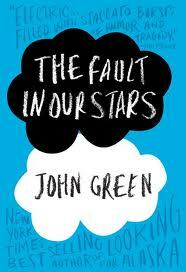 The novel is almost overwhelmingly sad, but it is Hazel's narration that prevents it from going over the edge. Her sarcastic and honest voice had me laughing through my tears. Augustus Waters is probably the best YA boyfriend to ever be written. He says gorgeous things like, "You are so busy being you that you have no idea how utterly unprecedented you are." His clever, generous heart is what you wish everyone experiences in a lifetime, even if it is far shorter than it should be. I am the endearing combination of broke and cheap, but this is a hardcover book I was happy to pay for, if only because it makes it easier for me to lend it to everyone I know. If you've read this book, you are probably as thrilled as I am that it didn't end the way I dreaded it ending. You know what I'm talking about.